DeMar DeRozan and the San Antonio Spurs will look to steal Game 1 of the 2019 NBA Playoffs on Saturday, when they travel to Denver to take on Nikola Jokic and the Western Conference 2-seed Nuggets. Denver handed San Antonio a nearly 30-point defeat just two weeks ago, and won’t go down easy on its home floor. These two teams split the season series, with the home team winning each game. The Spurs and Nuggets logged nearly identical against the spread records this season, but have struggled to cover as of late. Sportsbooks list the Nuggets as 5.5-point home favorites, down from an open of six, while the Over-Under, or total number of points Vegas thinks will be scored, is 211 in the latest Spurs vs. Nuggets odds. Before you make any Spurs vs. Nuggets picks, see what SportsLine’s NBA projection model has to say. Now it has locked in on Nuggets vs. Spurs. We can tell you it’s leaning over, and it also says one side of the spread hits in a whopping 60 percent of simulations. You can only see that pick at SportsLine. The model is aware of how well Denver has performed at home this season, as the Nuggets boast the NBA’s third-best cover rate (60.5 percent) as a home favorite. Meanwhile, San Antonio covered the spread just 43.5 percent of the time as a road underdog. Additionally, the Spurs enter the NBA Playoffs 2019 having only covered the spread in six of their last eight games. San Antonio’s calling card this season has been its fifth-ranked offensive efficiency, which could be negated by Denver’s stifling defense when playing at the Pepsi Center. Whether it’s opponents adjusting to the altitude or the Nuggets taking more pride in their defense at home, Denver has allowed just 103.6 points per game in the Mile High City. The Spurs failed to crack 100 in both trips to Denver this season and haven’t beaten the Nuggets in Denver since January 2017. But just because Denver has been unstoppable on its home floor doesn’t mean it will cover the Nuggets vs. Spurs spread on Saturday. The model also knows San Antonio is not an easy out in the NBA playoffs. The Spurs have years of playoff experience between their two leaders, Aldridge and DeMar DeRozan. The Spurs also have given Denver’s Nikola Jokic fits this season, holding him to averages of 17 points and 8.5 rebounds, both of which are well under his season averages. So who wins Spurs vs. Nuggets? And which side of the spread can you bank on in 60 percent of simulations? 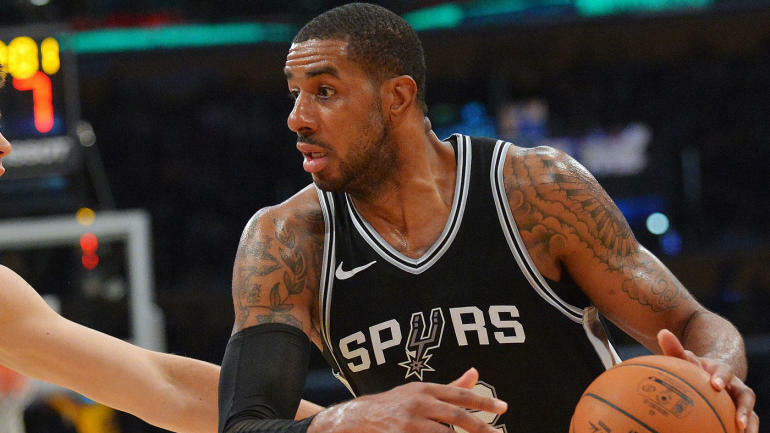 Visit SportsLine now to find out which side of the Spurs vs. Nuggets spread you need to jump on Saturday, all from the model that has crushed its NBA picks, and find out.